In the past few months I’ve really gotten into superfoods. Which is fairly obvious from this recipe, this recipe and this recipe. 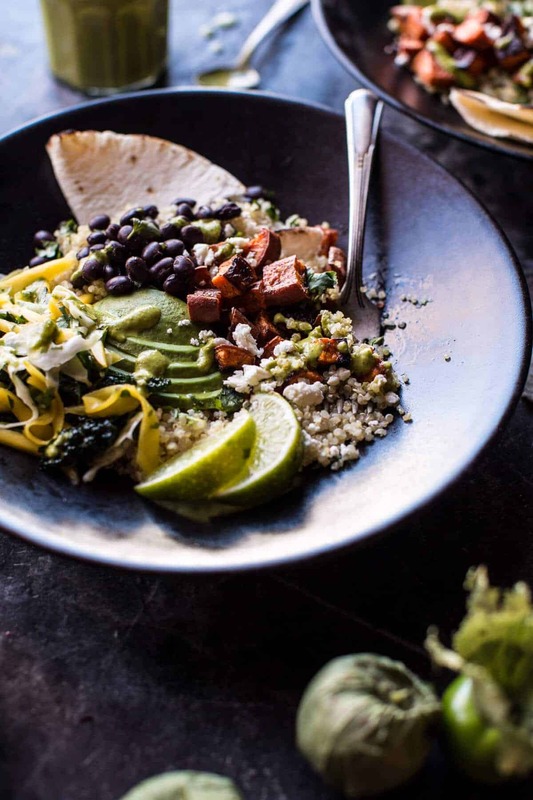 I’m loving their fresh flavors and vibrant colors, and these Southwest Quinoa bowls are just another example of how superfoods can be SO delicious! One of my favorite things to do with quinoa is to make quinoa bowls. I am a HUGE fan of “bowl food”…aka throw the contents of my fridge and pantry into a bowl and call it a meal. Bowl foods are my go-to when life is busy and I need a healthy meal…fast. 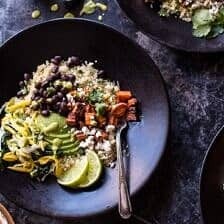 I pretty much always have the ingredients for these spicy southwest quinoa bowls on hand, making them so easy to throw together for lunch or dinner. 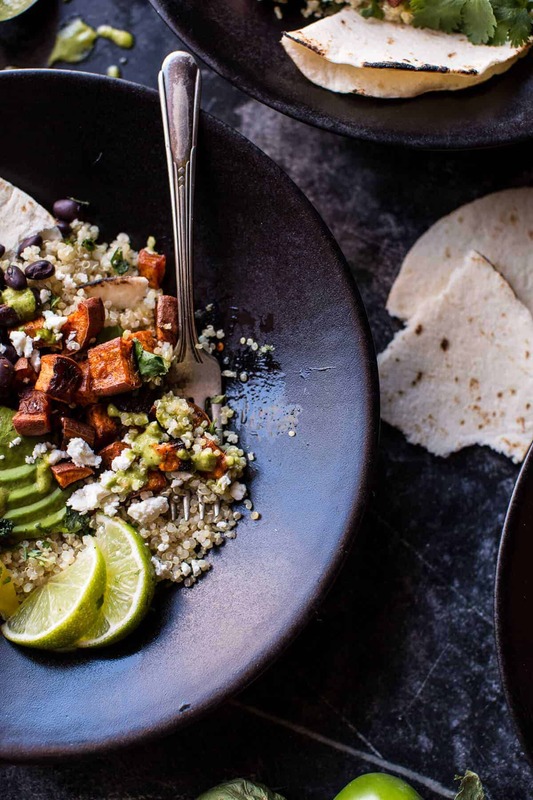 These bowls are LOADED with southwest flavors like sweet potatoes roasted in taco seasonings, black beans, cilantro, lime and quinoa. I also added a mango slaw, which gives off a nice sweetness and texture. Then everything gets drizzled with a charred tomatillo vinaigrette that will rock your world, delicious! 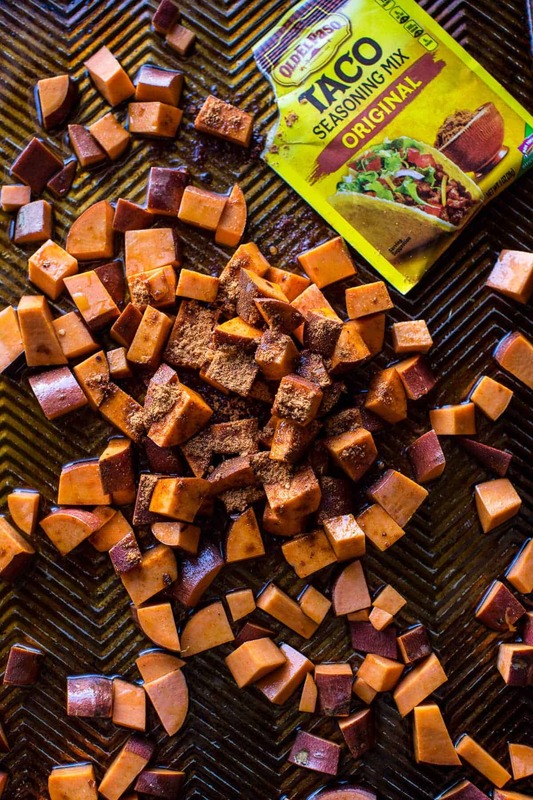 This recipe is great to make when you have leftover quinoa and sweet potatoes or simply if you’re craving a spicy southwest fix. If you’re feeling the need for a little more protein, adding grilled chicken, steak or my favorite…a fried egg, would all be great in this recipe! Prepare to enter the world of bowl food heaven! Whoa, I just jumped right into things there this week, huh? Welcome to Monday I guess! I am determined to have a KILLER week this week. I fell behind a little last week and I will not lie it was just one of those weeks where everything I worked on I was so not happy with. I think I re-shot like five recipes and over-thought everything, which in turn just makes things so much worse. I swear, over thinking things is one of my worst qualities. I guess sometimes it can be good, but for the most part I need to NOT think so much. If only I could figure out how to turn my brain off at times, and then turn it back on later…working on it, but it’s a SLOOOWWWW process. So basically positive thoughts, positive thoughts, POSITIVE THOUGHTS! Anyone, with me or what?!? Also, I feel I should tell you that I am on my second cup of lemon hibiscus tea and I think it’s really kicking in. My energy level is feelin pretty good at the moment, AND so is my tummy. I swear, lemon is a wonderful thing. Hehe, I love the word tummy. It makes me feel like a kid again. Oh, and speaking of kids, I think Asher is possibly beyond bored out of her mind on her little trip to Korea. On Saturday I got a text from her asking me if I would buy her a horse. Yes, a REAL horse. That question was followed by about ten separate texts of crying cat, broken hearts and horse emojis, followed by questions as to why I would not buy her a horse. I am not really sure who put the whole idea of Tieghan buying Asher a horse in her head, but ummmm, I’m pretty sure that is NEVER going to happen. She has also been sending me texts (via my mom’s phone) asking Harry Potter questions (she is OBSESSED, and THAT I could not be more excited about!). Ok, ok, ok. I feel like I am talking a million miles a minute here. I think we should get back to the point of this post. 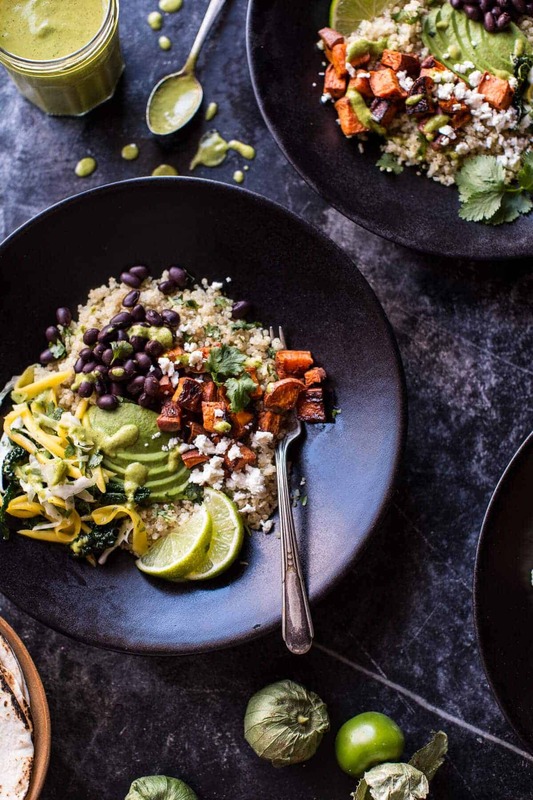 These spicy southwest quinoa bowls. You see, you need them in your life. It would be best if you could make them happen today, but anytime this week will work…but hey, do you really want to wait?!?! I mean, if you’re making spicy southwest food for dinner, I would say that’s a pretty good excuse for some fresh Margaritas??! 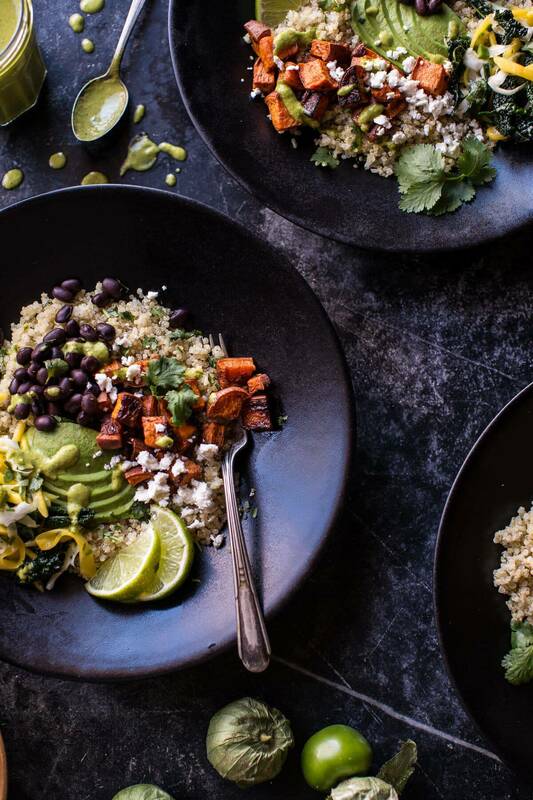 These bowls are LOADED with southwest flavors like sweet potatoes roasted in taco seasonings, black beans, cilantro, lime and quinoa. In a bowl, combine all the ingredients and toss well. Massage the slaw with your hands for 1-2 minutes. Cover and keep in the fridge until ready to serve. Add the tomatillos to the baking sheet and roast for 20 minutes or until the tomatillos are charred. Add the tomatillos and the remaining ingredients to a blender. Blend until completely smooth. Taste and add salt as needed. *NOTE: I like to roast the tomatillos and sweet potatoes at the same time. Cook the quinoa according to package directions. Fluff with a fork and toss with the zest + juice of 1 lime and chopped cilantro. Keep warm. Place the sweet potatoes on a rimmed baking sheet and drizzle with olive oil. 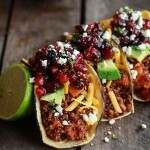 Add the taco seasoning and gently toss with your hands or two spatulas to evenly coat. Bake for 15-20 minutes, then flip and bake for 10 minutes more or until the sweet potatoes are tender. Toss the black beans with salt, pepper and a handful of chopped cilantro. To assemble the bowls, divide the quinoa among bowls. Top with the sweet potatoes, black beans and sliced avocado. Add the mango slaw and drizzle the bowl the with the tomatillo vinaigrette. Sprinkle with queso fresco and serve with warmed flour tortillas. EAT! *If you do not have queso fresco on hand, you may substitute cheddar cheese. *The vinaigrette can be made up to 1 week in advance, just keep covered in the fridge. The slaw can be made up to 2 days in advance and stored in the fridge. *To make these bowls a littler hardier, try adding chicken, steak, or my favorite - 2 or 3 fried eggs! YUM! 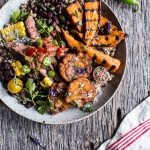 Brazilian Steak and Grilled Sweet Potato Fry Quinoa Bowl with Spicy Coconut Tomato Sauce. 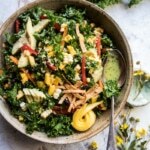 Southwest Mango, Kale, and Quinoa Chopped Salad. i keep meaning to try using tomatillos, but just haven’t. they sound so easy to cook and char though that i’ll have to! We LOVE bowl meals too, it’s just so easy and they always look cute! 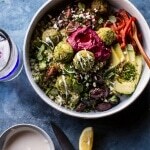 We usually make rice bowls but might have to get on the quinoa bowl bandwagon since it’s even healthier (and yummy too)! Also, that mango slaw – I think we need that in our life right now! Thank you so much! Hope you had a great weekend! 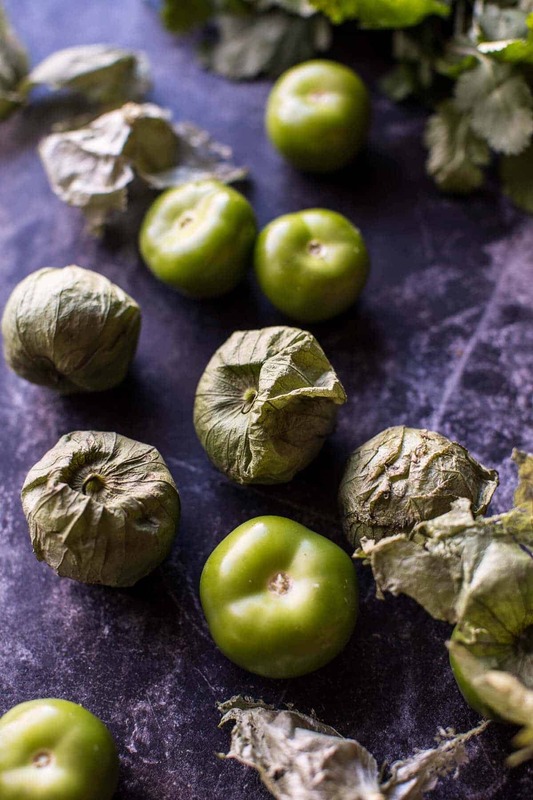 This looks amazing – I’ve never seen tomatillos before – they look really cute – are they related to the tomato at all? Thank Angela! They are related to the tomato I believe, but I am not sure. You cannot eat them raw however, they have to be cooked. Thanks! This quinoa bowl right here, just might change everyones view on quinoa! How could you pass up something so delish looking?! I mean come on, it’s drool worthy! I’m loving this bowl Tieghan! Such wonderful flavors all packed into one bowl! Perfect! Thank you so much, Mary Ann! Hope you had a great weekend! Looks yum! But we don’t have Tomatillos where I live. Can I substitute green tomatoes and lime juice? Horses were the single defining factor in my life growing up. They delayed the inevitable discovery of boys, taught me responsibility, kindness, compassion, that animals are friends and the list goes on. Consider lessons and leasing a horse if she is truly interested. Unlike a guitar it cannot be shoved under the bed and ignored. You must take care of it rain or shine even if you do not FEEL like it. BTW I am so making this amazing salad! 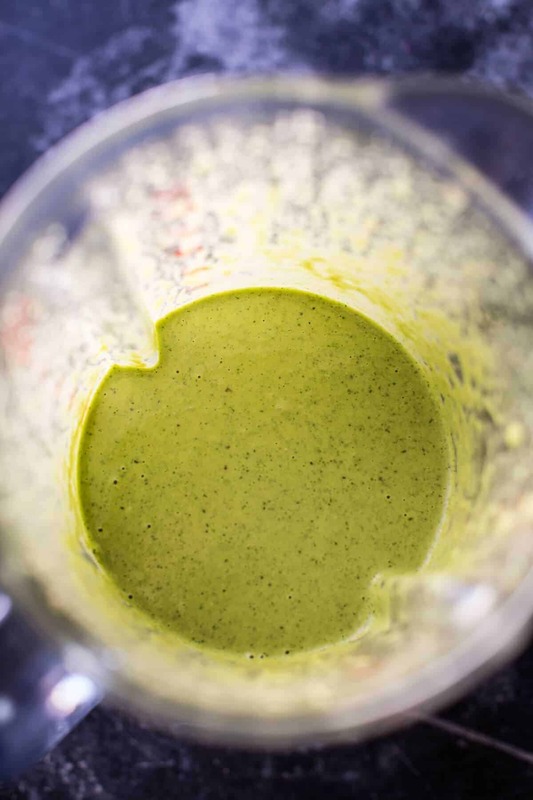 That Charred Tomatillo Vinaigrette sounds out of this world amazing!! LOVE! Thank you so much, Katrina! Hope you had a great weekend! hehe! Thank you SO much, Gerry! Hope you and your family had a great weekend! Perfect for National Margarita Day! That vinaigrette sounds killer, I can’t wait to try it. Mangos have been super good where I am lately, hopefully it’s the same in Colorado! This looks so yummy! I love quinoa in theory but sometimes it’s just too bland for me. This seems like it would be spicy and flavorful and yum. Never had quinoa with a southwestern fusion! I actually would really LOVE some right now!! 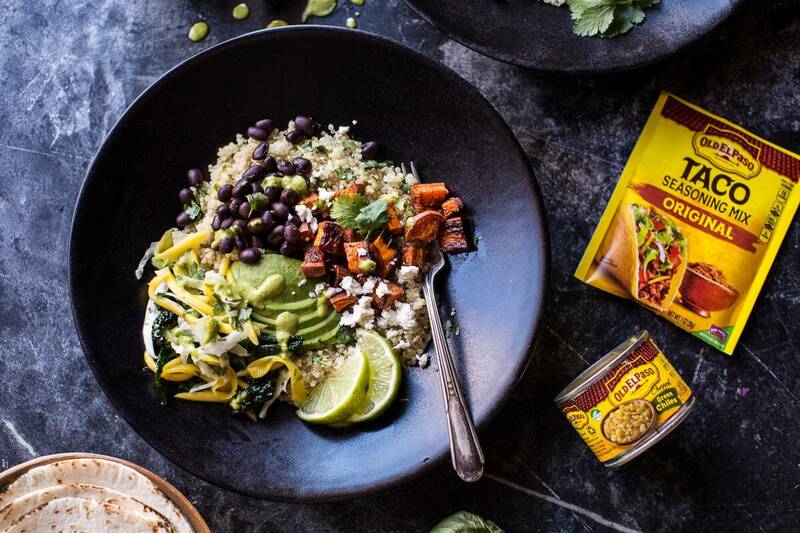 I love a good quinoa bowl and these Southwest flavors are the best! 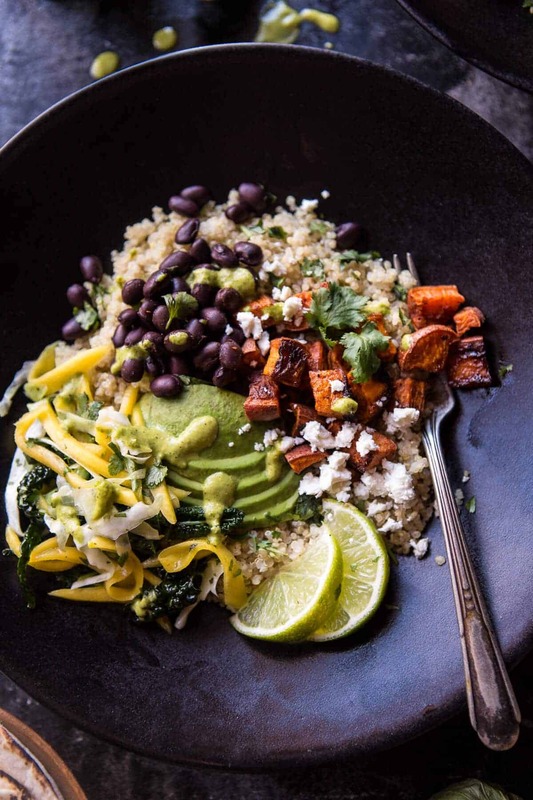 This quinoa bowl sounds soo amazing and bursting with flavor! I really need to try that mango slaw and the charred tomatillo vinaigrette. Can’t wait! I would have never thought to use taco seasoning! It’s so good! Thanks Kari! Was thinking of making these bowls in advance and storing them in a container in the fridge so I could take some for my lunch at school every day. Would it last well pre-prepared? How long would it last stored in the fridge? Wow. It was sooo good! I added a roasted jalapeño and some roasted garlic to the sauce, too! I love bowl food! I bet the roasted jalapeno was amazing! Thank you!! Tieghan, you’ve done it again! This is my new favorite meal. Today is my FOURTH day in a row eating this! Thankyouthankyouthankyou!! So, we made the Greek inspired salad the other day. Hubby loved. Today the Southwest Quinoa Bowl. Again, he said he could eat it every. single. day. and be completely satisfied. Yum! Thanks for the wonderful recipes Tieghan! That is so great and makes me so happy that you guys loved my recipes!! Thanks so much Amber!